If you have items to contribute to the newsletter, please contact the MSTD Publicity Committee Chair. MSTD Regularly Sponsors or Co-sponsors several topical meetings. The International Conference on Environmental Degradation is held every other year and has rotated between three societies with ANS last sponsoring the 14th meeting in August 2009 in Virginia Beach, VA. ANS will next sponsor the meeting in 2015. The International LWR Fuel Performance Meeting is held each year and presently rotates between the U.S. (sponsored by ANS), Europe (branded as the Top Fuel Meeting), andAsia. The U.S./ANS primary sponsorship rotates between MSTD and Fuel Cycle and Waste Management Division of ANS. MSTD will next sponsor the meeting September 26-29, 2010 in Orlando, FL. Some recent meetings include Orlando, FL (2004), Kyoto, Japan (2005), Salamanca, Spain (2006), San Franciso, CA (2007), Seoul, Korea (2008), and Paris (2009) held in conjunction with Global 2009. The Nuclear Fuels and Structural Materials for the Next Generation Nuclear Reactors (NFSM) was first held in 2006 and then in 2008 and 2010. The topical meeting is jointly sponsored by MSTD and Fusion Energy Division. Plutonium Futures to be held next September 19-23, 2010 in Keystone, CO. Earlier meetings have included: Dijon, France in 2008, Asilomar, Pacific Grove, California in 2006, Albuquerque, New Mexico in 2003, Santa Fe, New Mexico in 2000, Santa Fe, New Mexico in 1997. An Awards Luncheon was held on Wednesday, June 16th 2010. Award recipients can be found at: awards. The speaker for the luncheon was Dr. Ted Besmann of Oak Ridge National Laboratory. His presentation was titled, Oxide Fuel Thermochemistry at High Burn-Up. The next Awards Luncheon will be held at the 2012 Annual Meeting in Chicago, IL conferring awards for the years 2010 and 2011. Awards will be presented in the different categories detailed on this website at: awards with past recipients also listed. 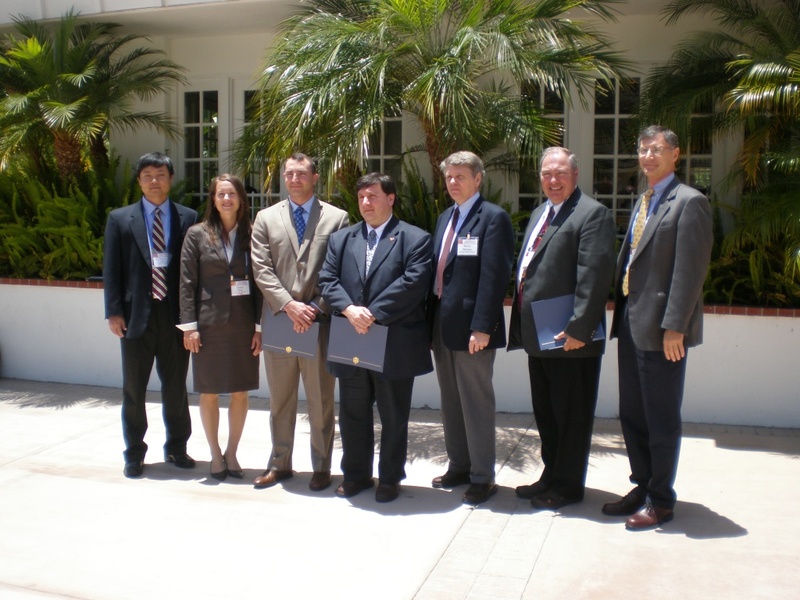 The Fourteenth International Conference on Environmental Degradation of Materials in Nuclear Power Systems-Water Reactors was held in Virginia Beach, Virginia, August 23-27, 2009. The long-standing tradition of strong technical discussion in this bi-annual series was continued. The topics covered a wide range of degradation issues unique to nuclear reactor service, including BWR’s, PWR primary and secondary systems, low alloy steels, ziraloy, stress corrosion cracking, and operational experience. Special sessions on advanced energy systems issues and extended operation were also held. This iteration of the conference hosted 229 scientists and engineers from around the world. Power utilities, reactor vendors, regulatory bodies, national laboratories and universities were present from 18 different countries. Over the course of the four-day meeting a large number of stimulating presentations were made (170), including several plenary sessions and a panel discussion on extended service issues. The proceedings for this meeting include 140 papers. The organizing committee and session chairmen devoted considerable time and energy to helping plan, coordinate, and direct this conference. Their efforts and advice are greatly appreciated. The students and typists from the University of Wisconsin, University of Michigan, Penn State University and Oak Ridge National Laboratory enabled the publication of the questions and answers. The American Nuclear Society provided expertise and assistance with the meeting arrangements, coordination, compilation and publication of this volume. Dave Slaninka and Ellen Leitschuh of ANS deserve special thanks for their help and patience. The meeting was held at its usually scheduled time slot of Monday evening from 7:00 to 9:00 PM. Pictured above left to right are: Sukesh Aghara, Kenan Unlu, Steve Zinkle, Jim Cole, Rory Kennedy, Todd Allen, Ken Geelhood, Heather MacLean, Robert Hanrahan, Maria Okuniewski, Jeremy Busby, Jim Stubbins, Travis W. Knight. Photo taken by Keith J. Leonard. An Awards Luncheon was held on Wednesday, November 15th 2006. Award recipients can be found at: awards. The speaker for the luncheon was Dr. Kemal Pasamehmetoglu of Idaho National Laboratory. His presentation was titled, GNEP Transmutation Fuel Development Overview. The next Awards Luncheon will be held at the 2008 Winter Meeting in Reno, NV conferring awards for the years 2006 and 2007. Awards will be presented in the different categories detailed on this website at: http://mstd.ans.org/awards.html with past recipients also listed. Please send your nominations to Jim Stubbins at: jstubbin@uiuc.edu. The first Topical Meeting titled “Nuclear Fuels and Structural Materials for the Next Generation Nuclear Reactors” was held in June 2006, embedded in the ANS Annual Meeting in Reno,Nevada. This meeting, co-sponsored by MSTD and FED, was chaired by Lance Snead, Dave Petti, Madeline Feltus, and Todd Allen. The meeting consisted of 107 total presentations on fuels and materials for advanced systems. The papers from the meeting will be published in a special issue of the Journal of Nuclear Materials, to be issued in 2007. The next NFSM will take place in conjunction with the 2008 Annual Meeting in Anaheim. Abstract submittal deadline has passed. Summaries are due January 6, 2006 for screening. Full-length papers will be due at the meeting and will be published in a special edition of Journal of Nuclear Materials (JNM). The meeting will include invited talks. The format will be one single session with a large poster session one evening (perhaps more than one if needed). Help is needed of MSTD members to review summaries and later to review full-length papers as guest editors for JNM. Volunteers should contact Todd Allen at allen@engr.wisc.edu. An MSTD luncheon was held on Wednesday of the 2005 Winter Meeting in Washington, DC. Attendees included: Seated (L to R): Ron Ballinger, Hannah Yount, Doug Crawford, Standing (L to R): Jim Stubbins, Sean McDeavitt, Kenan Unlu, Todd Allen, Travis W. Knight, Ken Geelhood. An awards luncheon will be held at the 2006 Winter Meeting in Albuquerque, NM. Two sessions are planned for the 2005 Winter Meeting in Washington, DC on Fuels and Materials for Gas Cooled Reactors and Fuel Performance Modeling in Fuels and Materials. Jim Cole will be organizing the sessions on Gas-cooled reactors while Ron Ballinger will be organizing the sessions on fuel modeling. MSTD supported two sessions at the 2004 Winter meeting, titled Advances in Materials Testing and Analysis and Development and Testing of Fuels for Advanced Reactors. Thanks to John Lambert and Robert Hanrahan for organizing the sessions. At the 2004 Winter meeting, MSTD held an Honors & Awards ceremony. Awards were presented for significant accomplishments over the time period 2000-2003.
for outstanding achievement over their careers. A Special Achievement Award was presented to Ron Klueh for his book with Don Harries on the properties of irradiated ferritic-martensitic steels. A student literary award was presented to Alan Bolind for his presentation at an ANS meeting. On July 17th – 29th the NATO sponsored 32nd International School on Solid State Physics was held at the Ettore Majorana Centre for Scientific Culture in Erice, Sicily, Italy. The topic of this course was Radiation Effects in Solids, which was last addressed in an international school held at the University of Illinois in 1993. Pictured above: Neal Ham, Julie Tucker, Micah Hackett, Gaurav Gupta, Clay Dickerson, Erin Haney, Gabriel Sawakuchi, and Maria Okuniewski pictured after the school ended. Eight graduate students from the United States were able to attend the course with partial support from the Material Science and Technology Division. 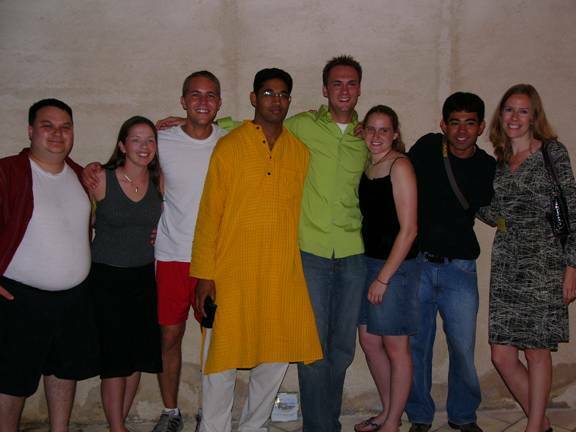 Neal Ham, Micah Hackett and Gaurav Gupta from the University of Michigan, Julie Tucker, Clay Dickerson and Erin Haney from the University of Wisconsin, Gabriel Sawakuchi from Oklahoma State University and Maria Okuniewski from the University of Illinois participated. Course participants enjoyed lectures and laboratories with international experts in areas such as fundamentals of radiation damage, characterizing radiation damage using electron microscopy, ion beam irradiation, irradiation assisted stress corrosion cracking, molecular dynamics, kinetic Monte Carlo and much more. 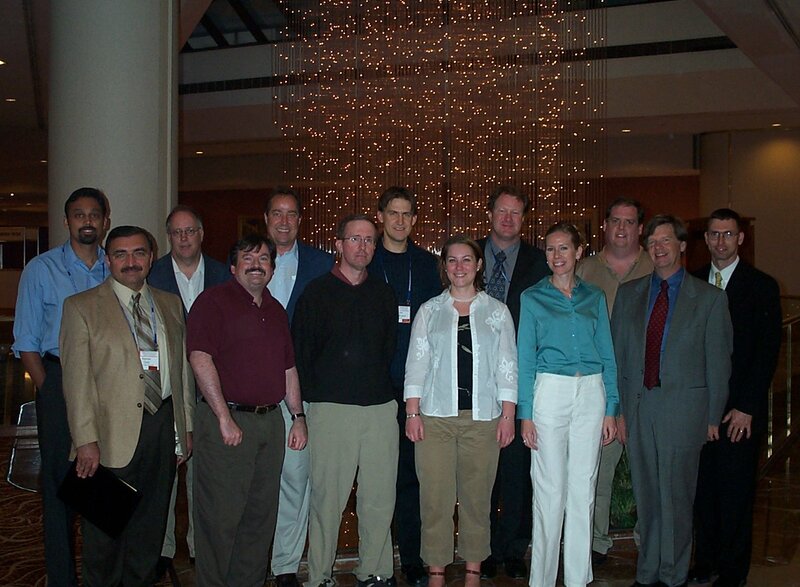 MSTD held seven sessions at the combined Summer Meeting/ICAPP Topical held in June 2004 in Pittsburgh. These sessions were well attended. MSTD will sponsor three sessions at the Summer 2005 Meeting in San Diego. These will be on Atomistic Modeling & Continuum, Lead-cooled Fast Reactor Systems, and Supercritical Water-cooled systems. Thanks to Tetsuo Shoji, Ning Li, and Todd Allen for organizing these sessions. Congratulations to the following new MSTD Executive Committee members. Thanks to the following outgoing members for 3 years of service. Congratulations to Executive Committee member Travis Knight. He has accepted a faculty position at the University of South Carolina.